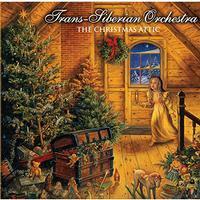 This classic Trans-Siberian Orchestra album has just been reissued on vinyl. That by itself would be news, but it’s better than that. First, it’s been remastered and sounds great. Secondly, this is high quality, heavy duty vinyl. It’s a double disc set, too. Add in the fact that this a limited edition, numbered release, and it’s obvious this is special. Musically, this album is one of TSO’s more diverse. I always consider them to be metallic progressive rock, but this one is less metallic than some of the others are. I like this a lot, and this version is well worth having as a collectible or given as a gift. It’s a great way to make a special holiday for the music collector on your list. A piano starts the song. It feels very much like traditional Christmas music. The vocals come in over the top of this arrangement. Only strings accompany the two elements. This is pretty and mellow. This also starts with keyboards, but crunch guitar joins very quickly. The introduction and the song is reborn as a crunch driven version of the classic Christmas song. There is some great technical guitar soloing built into this. It’s still very much a prog piece, just a metallic one. This instrumental runs through several changes and variants before winding back down. It gets a short piano treatment at the end. Piano and voice is the concept early. The vocals are quite theatrical. It gets some crunch built into it as it moves forward. That crunch exists on the chorus, but the song drops back to piano and voice on the verses. This is basically a power ballad. There are piano based verses on this number, too. It has quite theatrical vocals. It gets a lot of powered up music as it carries forward, though. This is very much powerhouse progressive rock. Yes, there is some crunch, but it’s nowhere near real heavy metal. This instrumental is powerful and melodic. Sure, there is some metal in the mix, but this is definitely another progressive rocker. This two part instrumental is very much a symphonic prog piece. Although this starts off traditionally, it works out to a jazzy kind of jam. Sure, there is crunch in the mix, but there is a lot more jazz and old school rock and roll than there is metal here. At times this reminds me of Meat Loaf. The gospel vocals later lend a lot of soul to the “Hallelujah Chorus” bit. With piano and chorale vocals, this first section reminds me a lot of the kind of stuff Vince Guaraldi did for the Charlie Brown Christmas soundtrack. From there it works to gentle and quite pretty piano music with strings. This is very classical in nature. Those vocals join in the mix as this moves forward. The opening section on this is delivered in a crunchy instrumental arrangement. We get a very soulful female vocal as it gets into the second section. That one is delivered in a still crunchy, but quite melodic style. The piano is prominent throughout a lot of this song. It’s a piece that comes closer to pure metal than a lot of the disc, does. Still, it’s more of melodic rocker with a rough edge to it than it is a metal song. This instrumental does a great job combining symphonic prog with metallic elements. It’s a killer track. It includes a brief piano coda. Acoustic guitar sounds open this and build intricately as it moves forward. With female vocals, this pretty piece is very much a folk styled cut. It remains mellow and stripped back throughout. Piano starts this. This is one of the more dynamic cuts here. Parts of it are just piano and voice. Others are more rocking. Still, a different section takes into symphonic progressive rock territory for a hot instrumental movement. This is a very satisfying and compelling piece of music. This starts with a piano and vocal arrangement. As it gets into more metal territory, the vocals get more theatrical. This is a powerhouse symphonic rocker. Here we get another acoustic guitar based, folk styled number. It’s a good song. It’s slow moving and fairly evocative. There is a more powered up section, but it’s still based on the same guitar and vocal treatment. That section gets quite theatrical in terms of the vocal performance. Mellow and rather symphonic as it starts, this is quite a pretty piece. The female vocals make me think of Julie Andrews just a bit on the opening section. The cut works out to a more rocking, fast paced movement from there. That lands this more in the vein of symphonic progressive rock. The chorale styled vocals are cool. Starting with a mellow balladic approach, there is a real soulful vibe to this cut. It’s get more rocking later and is a real powerhouse at times.